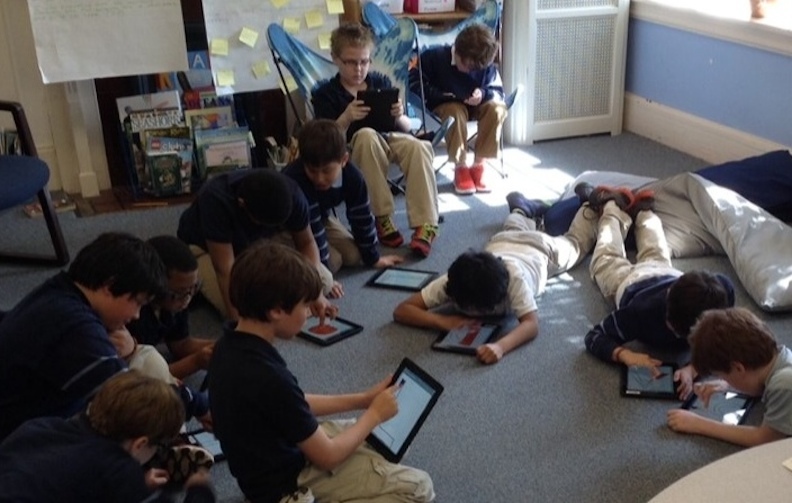 Continuing along the continuum of SAMR projects in the Lower School of SCH Academy, I’d like to share the work of Jodi Dawson and her third grade boys. Karen Kolkka and I recently met with Jodi to discuss potential 21st century projects based on existing learning goals and desired outcomes—the result is the transformation of a traditional Social Studies and research unit. Below the condensed version of the iMovie presentation, is a full description of the project from Jodi and Karen. Be sure to watch the credits at the end of the video! The third grade researched Influential Philadelphians in history which included, William Penn, Absalom Jones, Betsy Ross, Benjamin Franklin, Richard Allen and Mary Katherine Goddard. In partners, they wrote important facts about their historical figures. While on a field trip to Old City Philadelphia the boys used their ipads to capture video and photographs about their Philadelphians. Using Book Creator they embedded their photos and video to help tell their history. Very often, classroom research projects prove fertile territory for richly layered new media sharing opportunities. Jodi Dawson’s third grade class made this evident with their Influential Philadelphians research project. The class began by choosing to organize the writing component of the lesson in a Book Creator format. The Book Creator iPad app encourages students to design the layout best suited for the content. We discussed the importance of making thoughtful decisions about choices regarding color, fonts, page layouts, and any interactive components. The students collaborated in pairs on this project, we often overheard them coaching one another on these decisions. Content for the books contained music clips paired to the writing, as well as drawings, photos, videos, and hyperlinks. Another new media opportunity for this lesson was the chance to share with a live audience during an assembly—the students chose to create an iMovie. We discussed the fact that the class had twelve students and the word Philadelphia has twelve letters providing a perfect occasion to have students each design one of the letters using their iPads and the Penultimate app. The class then assembled in the tech lab in front of the green screen and one at a time raised the iPads to reveal the next letter of the word Philadelphia. Photos of Philadelphia were inserted behind the students in iMovie. Brief audio clips of classic Philadelphia/Rocky tunes made the opening scene and credits as exciting as the research content!